Ok, so I have a problem. I tend to start projects that are so massive I'll never finish them, and will often spend years of my life on them before having to give them up. And then only because other massive projects have taken up too much of my time. This, then, is the portal to all those wonderful geekeries that have occupied that time in the last decade. Siskoid's Blog of Geekery is my blog. Two posts a day, including a daily SF review. Comics, TV, movies, RPGs, nothing I won't touch. Check it out if you like geek stuff. 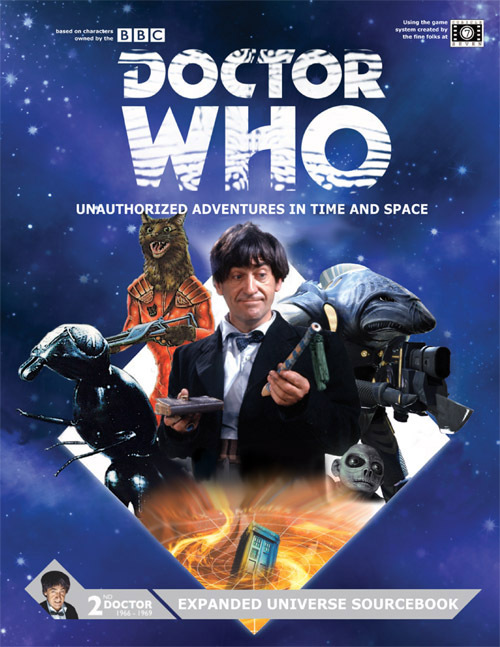 Companions to the Doctor Who: Adventures in Time and Space role-playing game, these unauthorized sourcebooks cover each Doctor's extra-canonical adventures from novels, audios, comics and more. My team and I write up all important allies, enemies, locations and gadgets from these, plus a little more. Each book is available in pdf format, both high-quality for printing and low for web browsing. DCHeroes: Siskoid's Collection I once attempted to go through my DC Comics collection (mostly running from 1983 through 1997) and figure out stats for all characters in Mayfair's DCHeroes terms. Started on the Dial "H" for Hero feature in Adventure Comics. Old campaign: DCHeroes, I built a little site for the team (called The Crusaders - no relation to the Archie heroes). Old campaign: Dream Park. I did an impressive amount of work on R. Talsorian's long defunct Dream Park RPG to give my players more options. It's all there for whoever wants it. And there's GURPS Shiftworld, a little something I invented to make the most use out of my vast GURPS collection. This is a player resource/chronicle that probably won't interest the general public. What happens when you turn yourself and your friends into City of Heroes characters? This kind of idiocy. Team Lisa doesn't just feature bios of our heroes, but some humor as well. Haven't played in a while though. Improv Ligue d'improvisation du Centre universitaire de Moncton (Licum). I keep an archive of an old Improv league site I used to run. In French and very old school. Still, the improv players around here have been asking for it, if only for nostalgia's sake or the collectible card game based on their exploits. Also contains archive for the Ligue d'improvisation acadienne (LIA). Some extremely short movie reviews, mostly of films I own. Also did a few months of Movie Trivia this year, just between friends. Anyway, you may like to test your wits (all the answers are provided). The main project for a number of years was the Unauthorized Dr. Who CCG. Totally unauthorized, a new Dr. Who CCG by yours truly, which is a simulation of what an actual company might do. Multiple expansions, rarities, boutique products, starter and booster pack art, and even a random card generator. With more than a 3000 cards in its first edition, work had begun on 2nd. For 7 years, I wrote daily articles for Star Trek: The Collectible Card Game under the title, Siskoid's Rolodex. And I did a heck of a lot of dream cards for the game too. It got pretty crazy and I had to give it up. (Sorry guys.) Still, everything from those years is pretty much archived here. The Rolodex, AtoZ, A Siskoid By Any Other Name, The Kai's Revised Premiere, Stardate cards, MEGA-cards, An Episodeful of Personae, Trek for the Wars, and Where's That Picture From? Everything stops around the Fall of 2005.